Find below a Tax clearance form example. The detail of the registration numbers on the tax clearance certificate (TCC) depends on the various taxes that the entity are registered for. 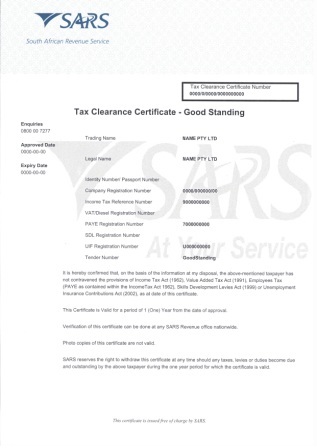 Once issued by South African Revenue Services this tax clearance is valid for 12 months. Apply early, because the Tax Administration Act of SARS make provision that the issue of the TCC could take up to 21 working days. On an annual basis your TCC need to be renewed. Once we have done your TCC for the first time, out office will contact you on an annual basis to remind you of the renewal .... making sure you always have a valid certificate ready for Tenders.